Military flyovers: Extravagance or invaluable? ORLANDO, Fla. - A fly-by at a sports event can inspire a crowd like nothing else. But is it the best use of mili-tary time and money? Only this time no one at the game noticed. The stadium's roof was closed. No one could see the U.S. Navy's Blue Angels overhead. And it was so loud inside that no one could even hear the jets. But the almost 100 million watch-ing on TV did get to see them for about four seconds. A spokesman estimated the cost of sending the six F/A-18A Hornets from their training home in El Centro, Calif., to Glendale, Ariz., and back at $36,000. Flyovers, once unexpected moments at major sporting events, are now almost the norm, expected parts of pre-game festivities. But an Orlando Sentinel investigation has found that you don't have to reach a very high bar to get one. At a time when the United States is fighting a war, fly-bys provide feel-good moments for fans, for sports leagues and even for athletes themselves - a spectacle that gives any sporting event added prestige and excitement. But are flyovers worth it, or are they a high-priced folly? "For the publicity aspect of it, I'd say it's definitely well worth it when you consider the cost to advertise during the Super Bowl," Blue Angels press officer Capt. Tyson Dunkelberger said. "The more people see our blue jets and recognize the Navy, the better it is for us." The U.S. Air Force Thunderbirds will perform a similar fly-by before Sunday's Daytona 500. An Air Force spokeswoman said eight F-16 Fighting Falcon jets will fly from Nellis Air Force Base outside of Las Vegas to Day-tona Beach and back at a cost of $80,000. For the flyover itself, six jets will be in the air for 40 minutes, at an ap-proximate fuel cost of $6,000. "The reason why we have this mission is to bring the story of the Air Force to people who may not have an Air Force base near them," Thunderbirds press officer Capt. Elizabeth Kreft said. "We're going to reach an untold number of homes with the Air Force message, and that's why we were given permission to do it." Military officials say the fly-bys boost recruiting efforts and give Americans an opportunity to see their aircraft in action. Officials also insist that flyovers don't cost taxpayers any additional money, because each flyover counts as a training flight and comes out of already existing training budgets and schedules. "Baloney," said Winslow Wheeler, an analyst with the Center for Defense Information in Washington, D.C. "It's atrocious training. They're flying from Point A to Point B. They're doing a couple of sort of low-altitude passes over the events and they go home. That's what pilots call 'converting gas to noise.'" The Orlando Sentinel investigation shows the Air Force, the Army, the Marine Corps and the Navy receive about 850 requests for flyovers or parachute jumps at sporting events each year, and that the vast majority of those requests are deemed eligible for aerial support - even if they're opening ceremonies for local Little Leagues or international tennis matches or minor-league baseball games. And once an event is deemed eligible for support, usually it's up to individual teams or leagues to find available squadrons to perform the fly-by. Commanders also can access their armed services' Web sites to see a list of ap-proved flyover requests and then approach teams themselves. Department of Defense Form 2535, the three-page application that must be filled out for every fly-by request, makes no mention of sporting events. Its instructions state that "requests for flyovers will be considered only for aviation-oriented events … or for patriotic observances (one day only) held in conjunction with Armed Forces Day, Memorial Day, Independence Day, POW/MIA Recognition Day or Veterans Day." Freedom of Information Act requests filed to the Air Force, the Army, the Navy and the Marine Corps yielded approximately 4,600 pages of documents but still proved incomplete in some cases. The Air Force is the only one of the services that compiles a full spreadsheet of the applications it receives; it's also the only one that tracks the number of sporting-event flyovers it conducts. The Air Force received 926 applications for flyovers at sporting events held in 2005 and 2006, not counting the requests that were filed late. In all, 762 of them, or 82.3 percent, were deemed eligible for fly-bys. Ultimately, 440 events, or 47.5 percent of the total number, wound up receiving flyovers, according to statistics kept by the Air Force. "We look at these events as a way to get our message out to a more diverse audience than traditional routes," said Wendy Varhegyi, a civilian who leads the outreach division within the Air Force's division of public affairs. "We look at sporting events as a way to reach a unique audience that is typically of recruiting-age interest, etc." Not counting applications filed late, the Navy received 492 flyover or parachute-jump requests for sporting events held in 2005 and 2006. Of those requests, 469 of them, or 95.3 percent, were deemed eligible. But, because of a lack of manpower, the Navy did not track the total number of flyovers its units conducted. "For the Navy, it's one of the few ways we have to show a large percentage of the American public an actual physical asset of the Navy," said Cmdr. John Wallach, whose community-outreach office in Millington, Tenn., processes all of the fly-by applications the Navy receives. "Flyovers are done all the time at sporting events: the World Series, Super Bowl, routine NFL and Major League Baseball games, etc. Anything that has an open roof in terms of sporting events." The interview was conducted before Super Bowl XLII. The Army and Marine Corps did not track the total number of applications they had received for sporting-event flyovers in 2005 and 2006 or the number of flyovers they had performed. Lt. Col. Shawn Jirik, said her office within the community relations division of the Army's office of the chief of public affairs didn't have the manpower or the resources to track that data. In 2001, the Department of Defense issued two directives - No. 5410.18 and No. 5410.19 - that allow the secretar-ies of each armed service to decide what events may receive flyovers and gives the Assistant Secretary of Defense for Public Affairs the authority to create flyover policies for major events. Those requirements are easy to meet. Aside from gaining Federal Aviation Administration approval, teams or leagues that request flyovers only have to stipulate that their events are open to the public, aren't political in nature and aren't fundraisers for any one charity. In addition, teams or leagues usually must provide space for military recruiters. This past college football season, 12 bowl games were held on Dec. 31 or later at open-air stadiums within the continental United States, and each one of them featured either a flyover or a parachute drop. Lower-profile amateur events also have received some kind of military support in recent years. Once in the early 2000s and again in 2006, the Leap Frogs, the Navy's parachute demonstration team, did jumps for the Clairemont Hilltoppers Little League's opening ceremonies in San Diego, said the league's board chairman, Wil-liam S. Conner. 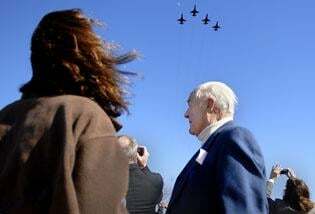 On April 8, 2005, the Navy was supposed to perform a flyover at the Virginia Beach Little League's opening ceremonies, but that fly-by was canceled because of poor weather and because the date of the opening ceremonies changed, a league official said. The flyovers that take place concern Pete Sepp, the vice president for policy and communications of the Na-tional Taxpayers Union, a government watchdog group based in Alexandria, Va. "I don't want to get too dramatic here, but military training probably is a more important thing today than it has been for a whole lot of time," Sepp said. "The time these folks get in the air could save their lives in a very real near-term combat situation. We have a duty to make sure all those training dollars are being put in the right place without any kind of external consid-erations." Wallach believes flyovers are a part of the military's community-relations duty and are more important to the Navy than to the other branches of the armed forces. The Navy, he said, has a "unique awareness challenge," because in contrast to the Air Force and Army, the Navy has few installations in middle America. Experts agree that advertising has been an essential recruiting tool since the U.S. ended the draft in 1973. "The military insisted that with a volunteer force they've got to get the message out, particularly because of the declining number of young people who had parents that served in the military," said David J. Armor, a public policy professor at George Mason University and the former acting assistant secretary of force management and personnel within the Defense Department during Ronald Reagan's administration. "I would have to guess, if there was no data, if there was no survey on it, that it is a plus to remind young people of military activity (through flyovers)." There is one other thing all the armed forces have in common: Their officials stress that flyovers do not cost the public additional money. Wallach drew the analogy of a checkbook. In that checkbook, squadron commanders are given a set number of flying hours each quarter. And training requirements, he said, are the bills those commanders have to pay. The flyovers have to be worked in along with training requirements. In other words, squadron commanders don't assign extra flying hours merely to schedule flyovers. There's no doubt that having aircraft appear over a stadium at the precise moment the national anthem ends requires skill - a kind of airborne ballet that requires exquisite timing. But Robert Owen, a retired Air Force aviator who now teaches at Embry-Riddle Aeronautical University in Daytona Beach, said that "the actual training benefit of a flyover is probably pretty minuscule," even though he supports flyovers. Owen said conducting a flyover at a sporting event and having those aviators attend the game or race afterward could be used to reward servicemen who have recently completed some difficult missions. He also stressed that squadron commanders think very hard about how to maximize the training benefits of fly-bys. In such sporting events there is no need to use these special jets. This is just wastage of money and nothing else. However, many young guys crave to have a career in the defense. They should start taking preparation in advance, like being familiar with different kind of firearms. It is best to approach a firearms training center like Accurate-Edge.com for this purpose. There was no point in sending these jets for the games, if no one can see these then it is a wastage of money. The defense should consider using the money for getting good quality materials for the weapon manufacturing and training. They should also get the best metallization service provider.